Legal Compass Subscriber? Sign in here to Download the Report. The last decade has brought substantial changes to the business of law and firms alike. 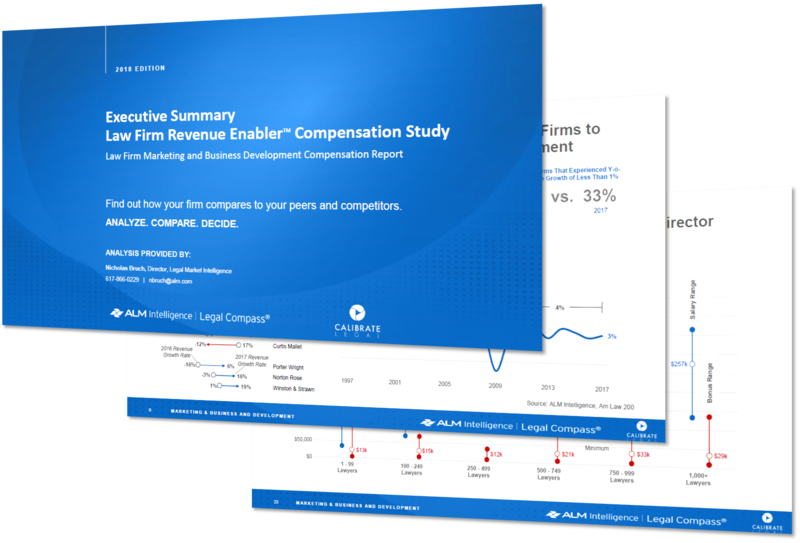 This year’s report and tool are drawn from a survey of more than 880 marketing and business development professionals from across North America conducted by ALM Legal Intelligence and Calibrate Legal, Inc. during June and July 2018. Some key findings of the report indicate that most “1st Chair” marketing and business development leaders report directly to their firm’s managing partner, that career progression is not clearly defined within most firms, and that total compensation varies widely between firms. The study also found that marketing and business development departments are hiring most quickly in middle management and business development roles. Budgets are increasing: 49% of firms said their marketing and business development budgets (which average 2.1% of total firm revenue) are increasing. Diversity: women hold 71% of C-level marketing and business development positions and 72% of director positions. C-level Compensation: chief marketing and business development professionals earn $400,000 dollars on average. Director and Manager Compensation: directors in marketing and business development departments earn an average of $276,000 in New York City. Job Satisfaction: 67% of coordinators, analysts, and specialists report they are content within their current role, although many are concerned about the lack of opportunities for advancement. For immediate assistance, please call 888.777.5647 or email almlegalintel@alm.com.